The Allan water has a secret, a secret that nobody has ever been told. Follow the old Darn road, beyond the mighty Kippenross oak tree, down below Drumdruills, and you will find a cave. This is Stevenson’s cave. Stevenson’s cave is 700 years old. However it was not always a cave. For long ago, before a time that we can remember, it just appeared overnight. Go there on a cold winter’s day and you may feel its breath, for once upon a time, a grumpy old Witch cast a spell on a giant. That giant was Wally Mint. Poor Wally was frozen instantly by her spell. 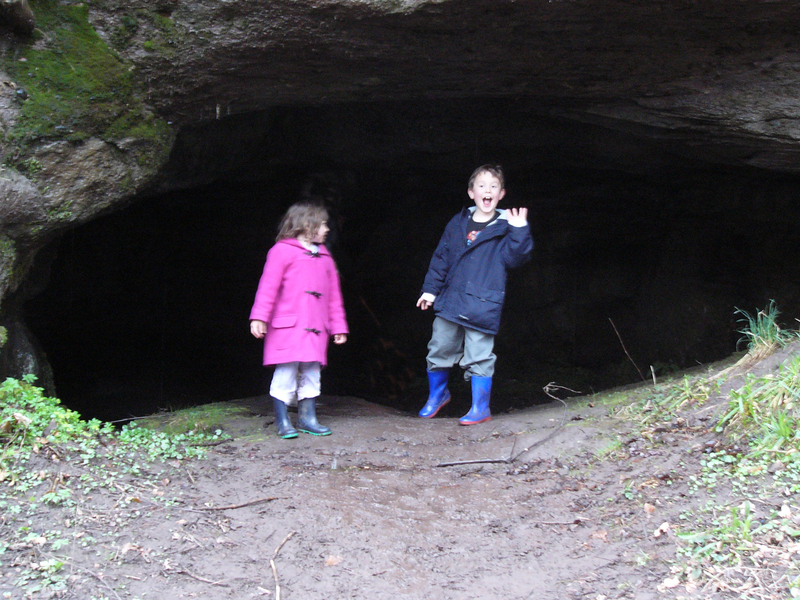 His mouth was turned into a cave -Stevenson’s cave. His body and head was turned into a stone monument. Many moons passed and poor Wally was completely forgotten. That spell on Wally could not be broken. One cold winter’s day icicles formed in the cave – like broken teeth. A seven year old boy called Andrew was walking along the Darn road with his family, when he heard a whoosh like a cold breath – it came from the cave. Finding a broken icicle he picked it up and took it home. Andrew brought that icicle home but realised it was beginning to melt. So he put his broken icicle in the freezer. Again he heard that whoosh. That night Andrew dreamt vividly and somewhat remarkably exactly the same dream as his sister Rachel. Night turned to day and Andrew and Rachel completely forgot their magical dream. Dreams can be like that. The news (boring… yawn…. ) was playing on their Mummy’s radio. Suddenly the announcer was interrupted with a News Flash: The Wallace Monument was missing! Not a stone of it remained. Scotland was in shock. Outside Mossgrove the ground shook. Only Andrew and Rachel knew why. Wally was on the move for the first time in seven hundred years! But where could Wally hide? – afterall half of Stirling was looking for him! Children from the nearby School of Bridge of Allan were called to help. Teachers, parents, pupils all were flabbergasted. Some even wondered if Wally had been stolen by Aliens! Mossgrove was Wally’s friend, of that much Andrew and Rachel were certain. An adventure was on the threshold. Andrew and Rachel just could not settle. They knew that they were Wally’s secret friends, but had no idea what to do next. A break for chocolate doughnuts helped recover tired brains. The Proclaimers sang “I’m gonna be 500 miles” and just then the door knocked. Andrew opened Mossgrove’s door – but nobody was there. Absolutely nobody! Rachel was as puzzled as Andrew! Yet something was missing . . .
Day turned to night and still there was no sign of Wally. Tony Blair was in despair, President Bush muttered, and the world was on stand-by for ‘other’ missing buildings: the Eiffel tower was guarded, Tapei-101 was closed, and the Statue of Liberty left in solace. Nobody could settle – worldwide talk was of nothing else: the disappearance of Wally! Andrew and Rachel fell asleep in their mummy’s arms. In Mossgrove hugs are as good for tired brains as chocolate doughnuts! Dreams returned to the young Gordons. Dreams not of Wally, but rather dreams of the Wobblisks. By ten-o’clock Andrew and Rachel were fast asleep, dreaming bright and clever. In their dreams imaginary friends appeared and whispered Wally’s secret. The next day they awoke to a crisp, frosty day with blue skies and sharp sunshine. Without really understanding why, Andrew and Rachel were drawn to Mossgrove’s door. The threshold was missing its two sentinels – stone guards in the form of obelisks that had stood as Mossgrove’s keepers for centuries. There in the exact centre of a truly circular lawn stood one of the Wobblisk’s good and strong. Midday was approaching and the Mossgrove clock struck twelve. The sun was cast in shadow from the Wobblisk. The shadow pointed due north and at the last chime of 12 there was a sudden flash and a beam of light burnt a cross into the grass. But what was this key and why had Andrew and Rachel been led to it by the Wobblisks? Rachel had bright inspiration: ‘Andrew,’ she said, ‘perhaps it is the key to Mossgrove’s upside-down lock?” Yes the adventure was just beginning . . . The key started to glow just the way Kipper’s did at the start of one of his fantastical adventures. Rachel could feel the magic and shivered in excitement. The Key was to fit the upside down lock exactly but needed the strength of all the Mossgrovites to turn it. The door creaked; and heavy dust and cobwebs gave way to glittering light. The dust danced in dizzy excitement as if understanding that this was the first time Mossgrove’s secret door had been opened in 700 years. Suddenly, as if from nowhere, a telephone rang. Its ring swished in, out, and through every museum artefact, until it found Andrew and Rachel. In a trance they were brought to the caller: a red telephone box! 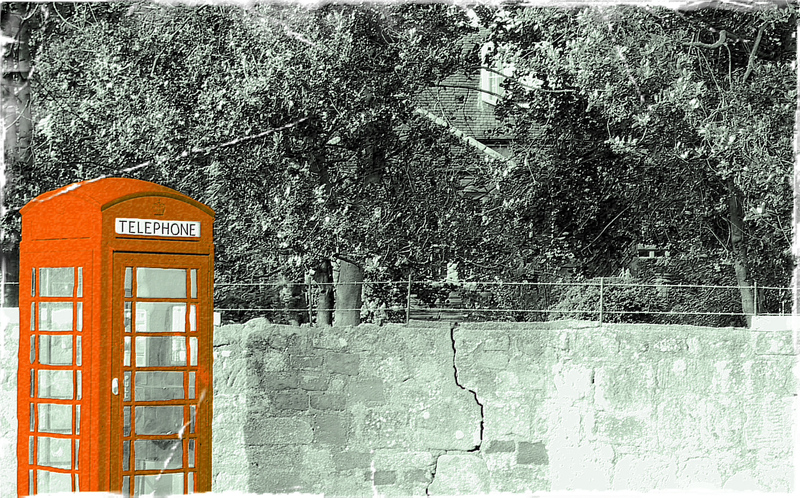 “This was Mossgrove’s Telephone box!” Andrew whispered to his little sister Rachel. They stepped inside ready for more adventure . . . It was just like being in Willy Wonka’s great glass elevator. 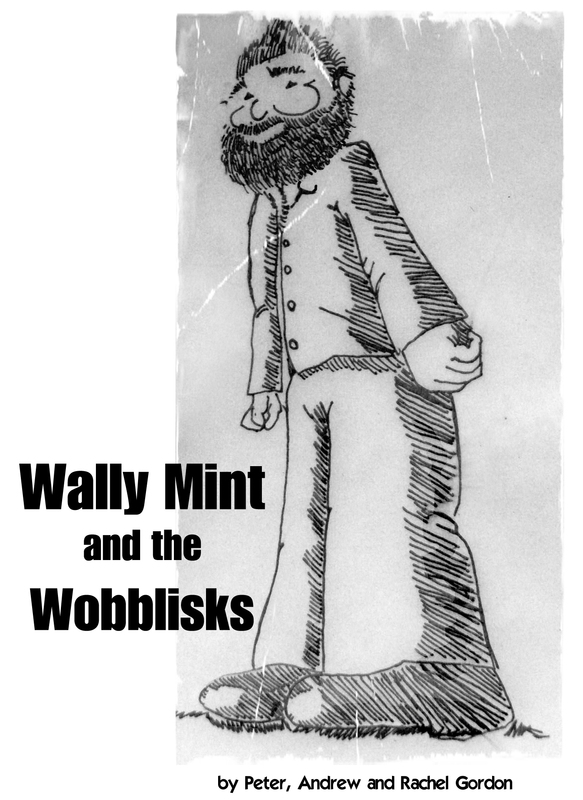 Willy Wonka, Wally Mint and the Wobblisks: that sounded fun! Yes magic really was in the air that night! Higher and higher they flew, ‘spinning and dizzying’ and shooting past Hale-Bop faster and brighter even than the comet itself! The red telephone box was truly a ‘spectacle sight’ and in many years to come, grandparents would tell grandchildren of that night and how the stars shone brilliant and how the brightest of all comets traversed the night. Yet there was more to that night, for magically little stars broke off from the comet and found their way into the pockets of all the disbelieving. 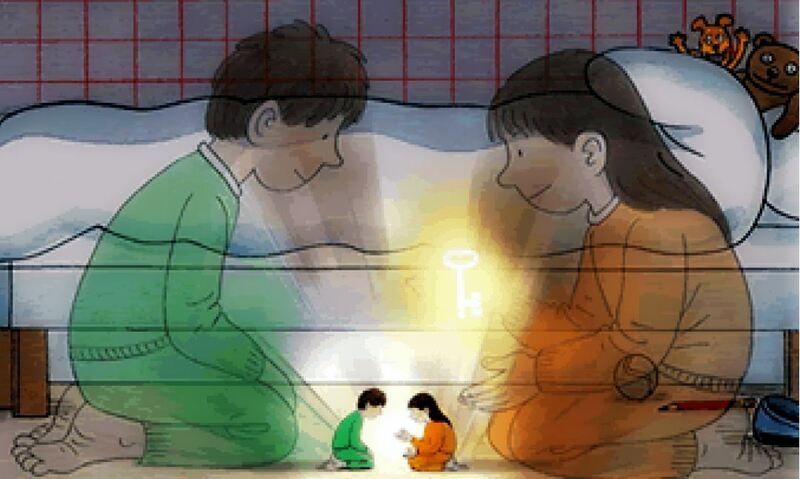 Children now had their own glowing-pocketful of stars to protect them from just about anything at all! Yes that was the night of Hale Bop and the red telephone box. The telephone box suddenly started to drop from the stars, spinning and dizzying all the way. 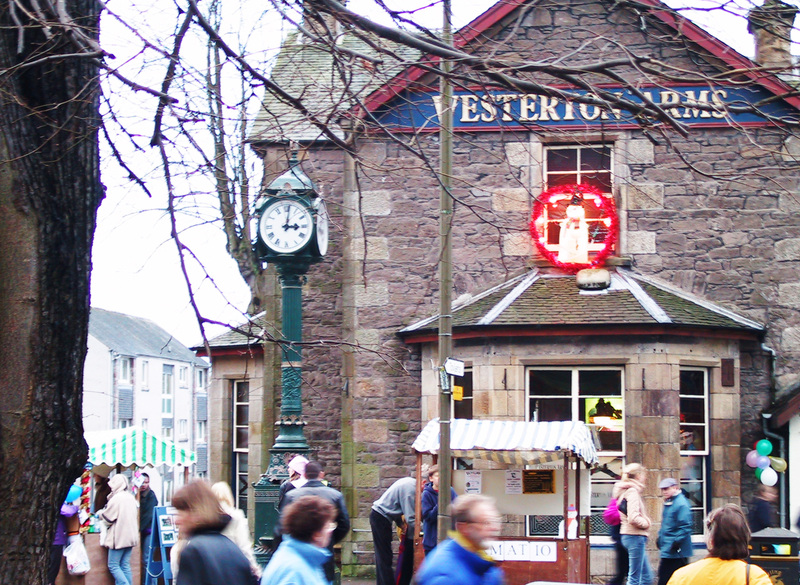 It was seeking its home in Bridge of Allan, but landed not at Mossgrove, rather just outside the Westerton Inn bang slap in the true heart of the village. Andrew and Rachel, dazed with excitement stepped out. Before them was Dr Paterson’s Clock. In days gone by villagers used to covet their doctor. In their memory, streets were named, and statues built. That was a long time indeed before the passing of Dumfoonert. Rachel was the first to spot it. Indeed it should have been obvious, yet villager after villager had passed that night without ever realising! The clock had three faces; east, south and west. Every dial told a different time. That is what eager young Rachel had understood in the blink of her long-lashes. This was no ordinary time; this was the third-time-zone. A magical time when nearly anything can happen. Indeed it could and indeed it would! The third time zone took Andrew and Rachel back 700 years to the time of Wally. A magical time when Wally Mint was loved and giants stood tall. Yes Wally was a friendly giant and was surely Scotland’s greatest friend. Never could it have been foretold that he would stand seven hundred years in stone and that his name would be lost in the mists of time. So it was that Andrew and Rachel returned to the third time zone – a time before stone. The witch was yet to cast her nasty spell and only magic could banish her evil curse. Andrew and Rachel were to be the keepers of Magic and were drawn mysteriously to the Wellingtonia, the largest tree in Westerton. It was here that Cleopatra’s needle vanished before it was dismissed as silly folklore. Cleopatra’s needle stood tall, but was nothing compared to Wally Mint the Giant. 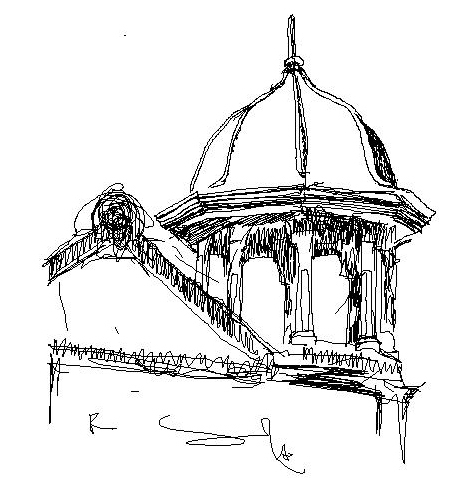 Andrew began to understand – the Needle was Wally’s pencil, and the Cupola on top of the Telegraph-Office Wally’s Cup. A pencil and cup may seem trivial and without place in Wally’s fate. But think again. Oh yes do. For Wally was revitalised with the spa water of Airthrey served in his magical cup. With his new pencil Wally scribed a poem to Blind Harry. It foretold a battle. A battle with a witch and a battle for Scotland. Help was at hand with the time-travelling Bridge of Allan cadets – Andrew and Rachel. Special folk for special times. Extraordinary times! The witch was the easier (if that was possible) of Wally’s extraordinary tasks. Young Rachel had been watching the Wizard of Oz and used a bit of the whiz that whoz! ‘Wally’ Rachel said, ‘cast that water from your cup upon the witch and she will melt.’ He did just that and there and then the witch melted. Gone for good and Wally was now free to battle for the fate of proud Scotland. Here now was where the fantastical inventiveness of Andrew saved Wally; making Wally a true hero, and securing his rightful place in history. 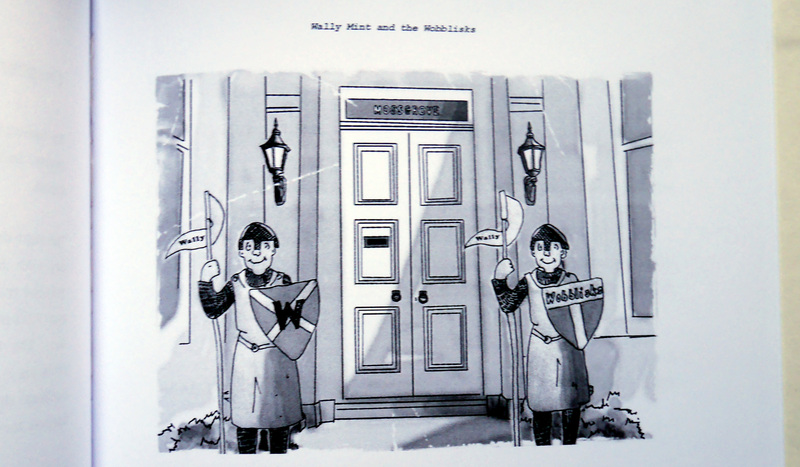 ‘Wally’ he said ‘I have a friend at the back of Dumyat; Pin of Loss’ and ‘he told me once if times were hard to remember him.’ Pin was a man as wise as he was old, and foresaw a time when Wally Mint would desperately need his help. 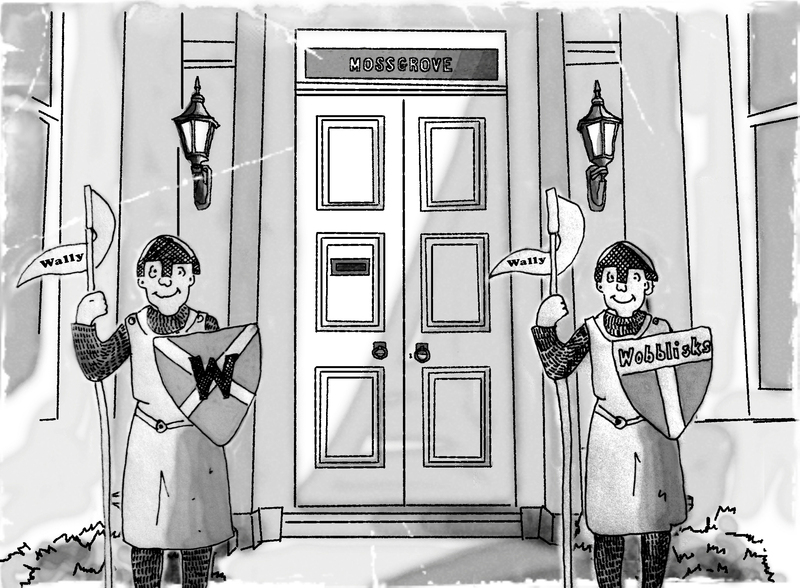 Andrew could understand that Wally the Giant, might manage to save Scotland, but what of the Wobblisks? Surely they were far too small to aid a faltering country. This was where the wisdom of ‘Pin of Loss’ and the sparkling genius of young Andrew saved a nation. Pin of Loss foretold how the battle of Stirling Bridge would be pivotal. Wally had strength but Pin had guile. The bridge was an extraordinary bridge. In its centre two pins held the span together. Andrew and Rachel had solved the puzzle. The Wobblisks, yes the Wobblisks were those magical pins. Small stone marvels. Wally and the Wobblisks. That was how the bridge collapsed and Scotland was freed. All thanks to Wally, the Wobblisks, and of course Andrew and Rachel. Chapter Nine: Wally’s place in History. The trouble with dreams is that they drift from the memory with such ease. So when Andrew and Rachel awoke they were back at Mossgrove. Outside stood the Wobblisks – back in their rightful place. Above St Ann’s Wally Mint rose proud and strong. Occasionally Wally would reappear in their dreams. His tears were of happiness for he knew the truth and that he lived on in the hearts of his young cadets. His tears became wobblisks, and just as they did for Andrew and Rachel, stood watchful guard over the homes of young children. Yes Wally would be back. Oh yes!